It's no secret that I'm a big fan of Captain Marvel, he who says "Shazam! ", and a big part of it is conceptual. I love the Golden Age stories, those I've read anyway, written by Otto Binder, of Captain Marvel, and they're some of the best drawn and most creative stories, not just of the Golden Age, but in the history of comics in general. They're just brimming with the type of creativity that Silver Age stories would be lauded for, and the art by C.C. Beck is clean, crisp, and always a pleasure to look at. It also isn't a secret that I'm not a fan of most of DC Comics' attempts to breathe new life into Cap (there have been three exceptions), and I believe that DC should have more archival collections of Captain Marvel and the Marvel Family. The Shazam Archives, unfortunately, stop right before Otto Binder took over from Bill Parker, and thus right before the character really took off creatively. One of the landmark stories in Captain Marvel history is called "The Monster Society of Evil," which ran in Captain Marvel Adventures #22-46, from March 1943 to May 1945. That makes it the longest-running serialized story in Golden Age Comics and thus a first of its kind for the superhero genre. This 25-part (!) 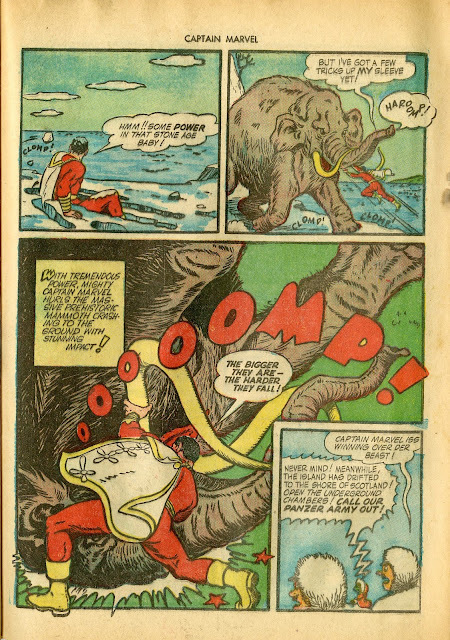 story features Cap's search for Mister Mind, the leader of the eponymous Monster Society, and they even make Mister Mind's appearance a mystery for a few parts there, even having him make an appearance without actually being outed. Really, it's good fun. Unfortunately, Captain Marvel fighting people around the world in the middle of World War II means it's full of racial caricatures. It was the time for such, and it's common in Golden Age comics. The Japanese, especially, are demonized — a known strategy during wartime to heighten the importance of your side winning. It's not just the villains either. Prominent in the early chapters is Steamboat, Billy's assistant, who is drawn in black minstrel fashion. Again, this is common in Golden Age comics. The works of Will Eisner (particularly The Spirit) and even Carl Barks are full of such depictions. However, that doesn't make it any less unfortunate. "The Tom and Jerry episodes included in this collection and the outrageous brand of humor shown here comes to us from a time when racial and ethnic differences were caricatures in the name of entertainment. Now while humor may have been the intent of such caricatures, they also had the effect of revealing society's unfair and hurtful representations of people of color, women, and ethnic groups. Now some of the cartoons here reflect prejudices that were common in American society, especially when it came to racial and ethnic groups. These prejudices were wrong then, and they're certainly wrong today. With Puss Gets the Boot, we're introduced to one of those caricatures, Mammy Two-Shoes. Mammy Two-Shoes had a key reoccurring role in a number of Tom and Jerry shorts and was an important component that made the interplay in those cartoons work so well... The fact that she is so definite a character even though we really never see her face is due to the acting and posing that Joe Barbera excelled at, the skills of the animators, and the excellent voice talent of Lillian Randolph. Removing Mammy Two-Shoes from this collection would be the same as pretending that she never existed. The same is true for the other images and jokes that we wouldn't normally include in a mainstream cartoon today. So Ms. Two-Shoes along with other elements that reveal the other prejudices at the time are presented here to accurately reflect a part of our history that cannot and should not be ignored." And I get that — Steamboat was a step in the portrayal of blacks in comics, just like the "evil Jap" was a step in the portrayal of Asians in comics. I've also been reading some Silver Age Marvel recently, and those are full of sexist dialogue, and obviously those are still being printed. Still, I think it was the right call to not reprint The Monster Society of Evil, and a huge part of it is that Shazam is slated for release as a movie soon. Ideally, that would bring viewers, and by that I mean kids, into shops to look for Shazam-related stuff. As opposed to Will Eisner's Spirit (the target audience isn't kids), Carl Barks' Donald Duck (the Fantagraphics collections I doubt are for kids; they're more historic, and Fantagraphics releases one-off reprints for kids as well), and even Tom and Jerry (where you can stick an intro by Whoopi Goldberg in there, and was also an important step in the history of acting for minorities, since Lillian Randolph was black), there really isn't much Captain Marvel–related stuff out there, and it'd just be risky to put out there, at least this early on. Additionally, like I said before, the Shazam Archives stop right before Otto Binder took over as writer, so there's a lot of actually really good Captain Marvel stuff that DC Comics could reprint and should reprint, most without the unfortunate addition of those racial stereotypes. I don't even think "Monster Society" is as good as some of the other Golden Age Captain Marvel stuff I've read from reprint-books-that-are-now-also-out-of-print. 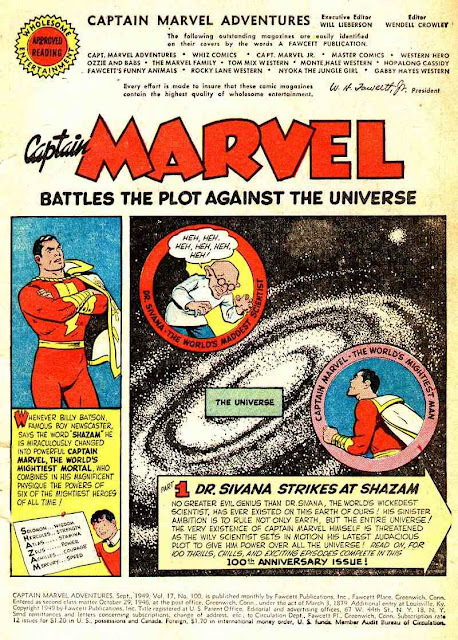 One of my favorites, "Captain Marvel Battles the Plot Against the Universe," is incredibly entertaining and to my knowledge has never been reprinted. Luckily, I can read it all on Comicbookplus, which is another reason I think it's okay for DC not to publish "Monster Society." The Golden Age Captain Marvel comics are, as I understand it, in the public domain, and those curious enough to read it can do so if they're so inclined. So should "Monster Society of Evil" be reprinted? I say no. There are other things they could reprint first, and maybe with a wide enough inventory, then they can think about it again. But it's a close call. What do you guys say? I own the limited run, over-sized collection that American Nostalgia/Hawk Books put out in 1989. It's definitely a "for the more discriminating collector" kind of product, like the Fantagraphics reprints you mention, and I don't regret it a bit. Even with the casual racism, it's a superb adventure story. I get that; I just think it would be a bad move commercially, and I do think there are better Cap stories from that era. 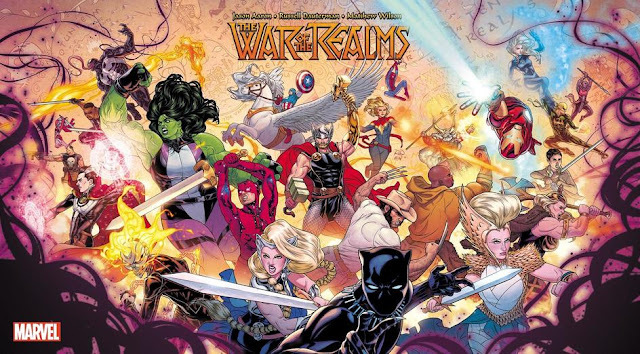 Being a lower quality Cap story in that era wasn't bad, I think -- that still means it was better than most Golden Age stuff.